If you want to become a truly competent and successful angler, there are some basic rules you need to follow. DAVID GREEN outlines seven proven strategies. FISHING is all about planning. There are hundreds of decisions made every time you go fishing, and the results at the end of the day come due to the massive algorithm of tactical decisions you make in the course of a trip. Over many years I’ve fished in all sorts of fishing tournaments chasing a wide range of species from flathead to marlin. While I’ve won quite a few events over the years, including the Barra Classic and the Flathead Classic, I’ve learnt a lot more from the times we got beaten by anglers who were better and smarter on a given day. As you get older you accumulate experience and cunning, but compensate for these gains by watching your fitness and reflexes slow a little. Over time I’ve found that the following rules are important to use as a mantra for all fishing trips to maximise your success. Tournament fishing has the great benefit of reinforcing these rules. All fishing trips are a mission – we aren’t talking about just having a “nice day on the water” here. The aim is to give yourself as many opportunities as possible regardless of the species you’re chasing, and to maximise the percentage of those opportunities when they come along. Rule 1: Intel Is Everything! When you plan a fishing trip you’ll need to know tides, moon phase, wind and sea conditions. 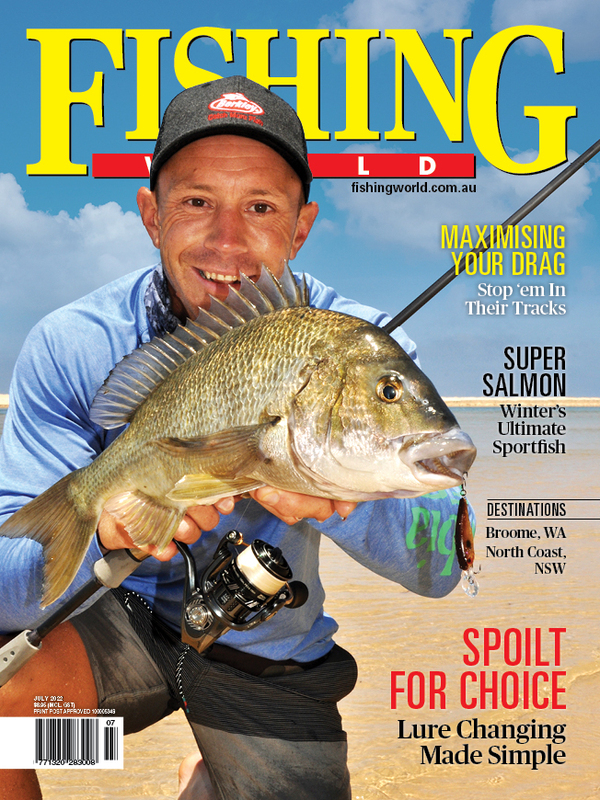 It’s also important to have as much reliable information as possible from the local fishing grapevine. The basic information is readily available via various apps on your smartphone. Social media is playing a bigger role in the dissemination of fishing info but is often unreliable. Once on the water you add water quality, water temperature, current and local conditions. If you see reports where anglers did catch fish, try and work out time of day, methods used and the spots they fished. Once you’ve analysed your data and looked at the local conditions you can then refine your game plan. This decision is invariably based on cumulative experience, local knowledge and current data. When fishing new or unfamiliar water it’s important to get as much information as possible about the geography. Google Earth is a mandatory fishing tool. A fishing plan is always at risk of failure, and all your available intel is the building blocks of risk minimisation. Think it out carefully and logically and remember every “Plan A” has a time line involving an alternative “Plan B”. If you’re fishing in any type of competition you’ll generally need to carry a variety of outfits to cover the many different styles of fishing you’ll do. Go through each outfit carefully prior to the event. Sort out all the leaders prior to going on the water, lay all the outfits down in front of you and go through a scenario-based check list. As an example, I often use six or more different outfits in a single session chasing flathead, and from time to time small threadlines move from one rod to another as I experiment with different rods, reels, line and leaders. When it comes to the main event, all the experimentation is over. A few weeks prior to a big competition, each outfit is optimised so I’m happy with it for the specific purpose it’s been allocated. 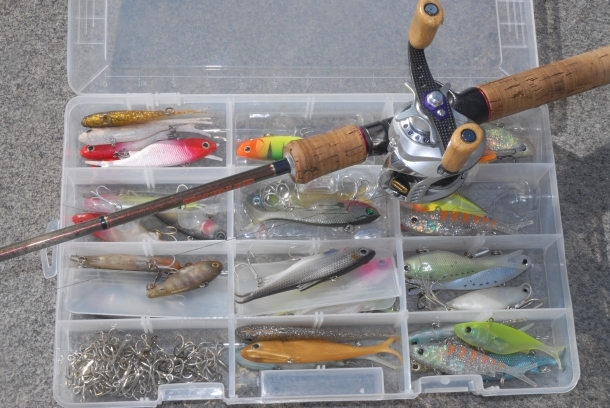 When it comes to fishing gear, you need to “get fussy, be fussy and stay fussy”. While you’ll never totally eliminate gear failure, careful preparation is important. I never like using any brand new rod or reel in a competition until I’ve run it in and am happy with it. Catching fish is more about finding the food the fish will be feeding on than it is about finding the fish themselves. For this reason you need to have a very good knowledge of the feeding habits of your quarry, and understand how the ecosystem you’re fishing in works. This can bring a delightful amount of subtlety into your planning, because when you concentrate your efforts on finding the bait, you learn a lot about the birds and other animals chasing the same food. A good example of this bait focused fishing happened to me a few years ago. On a big run-in tide in the Daly River the mullet poured upstream on the tidal wave down the centre of the river. 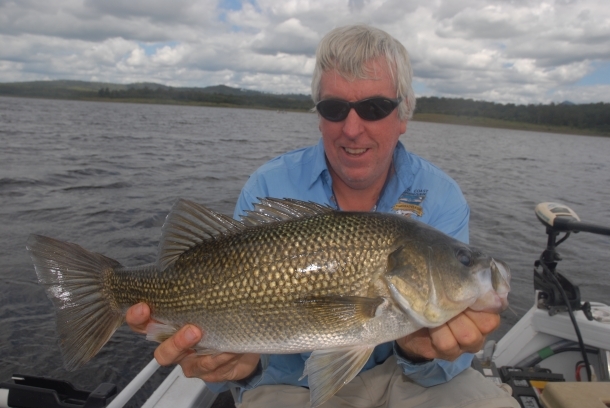 The water was filthy, but the mullet attracted large numbers of big barra. Over a few seasons I got quite good at the run-in tide big barra troll, and we came second in a very small tinny in the 2012 Barra Nationals largely due to three metre plus barras we caught using this tactic, as well as a few 90 to 100cm fish. When the mullet run up the middle of the river they move into the edges when the tidal flow slows down, and trolling the run out in mid river is generally unproductive as the baitfish are no longer out there. A year later in the Barra Classic well known NT angler Shane Compaine, on a neap tide, caught a stack of big barras throwing huge deep bodied plastics. We were very focused on chasing big barra on mullet imitations. What Shane had studied in detail were the habits of baby barras, and he found how, where and when the cannibalism of small barra took place, imitated the bait and caught a swag of monster fish. Those fish wouldn’t hit a mullet profile – they wanted a deeper bodied lure. The feeding activity occurs largely on the run-out tide as baby barra leave the feeder creeks. Many get descaled as they escape big barra hits, and the hawks and eagles can be seen looking for the damaged baby barra in the middle of the river. When the eagles are behaving like this, trolling or casting large plastics or deep bodied swim baits produces big barra. What we failed to do was adapt to techniques that suited the change in baitfish, and it cost us dearly. Fishing is a very inexact science, and the best plans are based on probability using your best guesses as to how and where a fish will feed. There’ll always be a time where the fishing dries up, the bites stop and the pressure to succeed will lead you to that perpetual question: Do I stay or do I go? In this scenario there are a number of things to consider, but you need to give serious thought to the following three possibilities. *The fish are present and feeding but the method used is wrong. *The fish are present but not feeding at that time. *The fish are not present. Only the third scenario means you should leave and try elsewhere. If there’s no bait present and other indicators have left, such as pelicans and water birds, it is a fair indication the fish have also left. If one important condition, such as water clarity, is clearly very poor, it’s also time to leave. But don’t leave fish to find fish. I’m a great believer in having a few “drop in” spots adjacent to my main fishing areas so I can go and fish a nearby spot for 10 or 15 minutes and “rest” the main spot so it can actively recruit more feeding fish. “Drop in” spots are generally small areas, single snags or weed beds where you may catch one or two active fish before you return to the main honey hole. Some spots will “wear out” through fishing pressure as a lot of the active fish will be caught, and in a big tournament it’s uncommon to see a spot last for more than two days unless it has a steady flow of fish migrating on to it. When fish become gun shy it’s often time for finesse. Lighter leader, smaller lures and slower retrieves can often unlock a shut down bite. 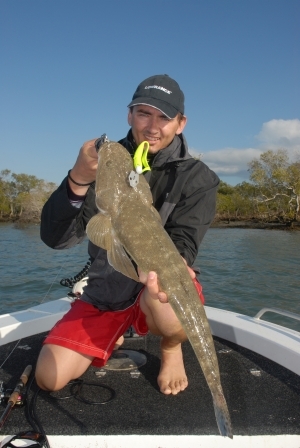 Change lures and lure types often if you know the fish are present but not biting. I’ve seen a single lure change ignite a bite a lot more than once, but only use lures you have confidence with and have caught fish on before in tournament situations. If you’re going through a rough patch and find you’re putting some weird piece of space junk on your line, give yourself a slap, cut the bizarre lure off and stay sensible! Re-rigging lines, eating, staring endlessly into lure trays, getting snags off, procrastinating and constantly changing lures all decrease the amount of time that is spent fishing. Good preparation prior to an event reduces down time, and good team work, fast fish processing and experience in snag removal all increase the amount of time you have to put lures in front of fish. I’ve watched some teams in big competitions go through “fishing malfunctions” where a single snag leads to all three anglers having to re-rig. Every team member needs an allocated series of jobs they are responsible for and the team needs to work together. All fishing trips are a competition between the angler and the fish, and if you win against the fish that’s all you can be expected to do. Set your goals, write down your plans and work out how many fish you expect as a “par” performance from each spot, factor in your peak times such as prime tide and feeding periods and go catch the fish. If you start worrying about what the other anglers are doing you’ll lose your focus on the fish. You always have a better chance of winning if you lead rather than follow. There’ll always be a better anglers than you, and if you start to get any degree of arrogance, tournament fishing will soon bring you down a few pegs. The secret is to learn these new methods in your general fishing. 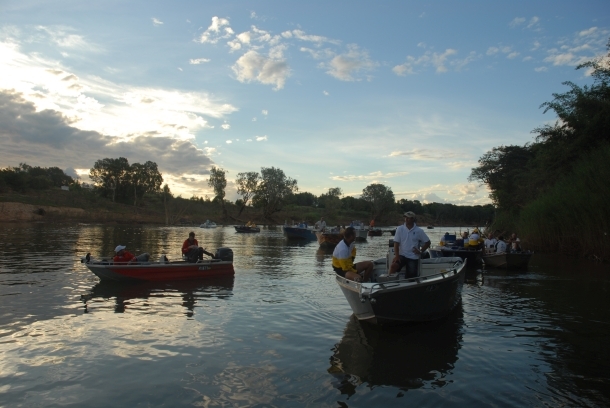 If you’re fishing in a tournament, stick to your own plans. Following other boats is a common tactic in some events, and I personally think this is very poor behaviour. Don’t be a blow fly! There’s a type of pressure in tournaments, particularly if you’re going well, where you will, in a fishless period, start to feel your shirt collar get tighter and you develop a fear of choking! I’ve had some great chokes over the years, but what I’ve learnt is that you can develop an immunity to choking. If the bite is slow, don’t worry about it! It will be slow for everyone. Stick to sensible game plans. The greatest chokes always involve leaving a productive area to make long runs to greener pastures that fail to work. If you stay focused and trust your gut feelings, fish will fall to you. Don’t stress, stay relaxed and make the most of any opportunities. When you think about it, we fish to reduce the stress in our lives, not to make it worse. The more relaxed you are, the better you’ll fish. While the above article applies to all fishing, I think tournament fishing is a very useful way to improve your overall fishing discipline and your catches by adopting the above set of rules.